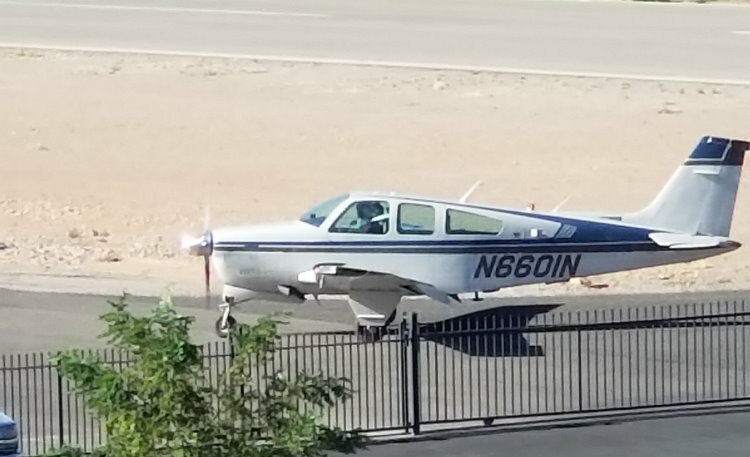 ST. GEORGE – Dixie Technical College received a surprise visit Thursday morning when a small plane touched down at the old St. George airport runway only to turn right back around and fly off. Around 9:50 a.m., a plane, identified as a 1983 Beech F33A single-engine aircraft, caught the attention of students and faculty at the Dixie Tech as they looked out the window to see the plane touch down and head toward one of the school’s buildings. On the video, the plane appeared to bounce on the runway after hitting the gravel as it approached the tech school’s industrial building, which made some observers briefly worry that the plane was going to collide with the building. Instead, the plane slowed and turned onto what remained of the old airport’s taxiway and took to the sky once more. Merrill and others at Dixie Tech caught the strange occurrence on video and said they couldn’t believe what they had seen. After leaving the vicinity of Dixie Tech, the aircraft’s pilot took the plane to the St. George Regional Airport. St. George Police officer Tiffany Atkin said the department looked into the incident. The pilot is from out of town and hadn’t flown into St. George since the new airport was built. The pilot also contacted authorities at the correct airport about the mistake. A check of the plane’s registry shows it originating out of Anaheim, California. No further action was taken by police due the incident being deemed a misunderstanding on the pilot’s part. In the wake of the old airport’s closure, the location was used for various activities like drag racing, SkyWest Airline’s Mini-indy event and the occasional concert. More recently the site has become the new home of the Dixie Technical College and is slated to become a technology business park called Tech Ridge. I thought you had to have permission to land a plane at an airport. Maybe somebody can correct me if that is wrong, but if not shouldn’t he have been in contact with the tower in order to get directions and all that? If that is proper procedure how does something like this happen? for a different airport, they all look the same when your flying around. You don’t need permission (in visual conditions) to land at an airport without a tower, as is the case at St George. Did this pilot get a preflight briefing? Are his ‘pubs’ eight and one half years old? In this day and age, flying is more complicated. There are these things called TFRs (temporary flight restrictions) that change every day. If you blunder over somewhere Trump is bloviating you will be met with a handful of F16s who will want you to land at the nearest airport and have a little conversation with you. That is one lucky pilot. And probably one very embarrassed one as well. 🙂 Glad it turned out OK for him. Not really his fault…he received pilot briefing from Harrison Ford. It’s obviously Trump’s fault!!! He’s diverted money from the FAA budget to ICE! And if you don’t believe that it’s his stance on global warming! So what does Trump and ICE have to do with this article ? lol some people are just ..out there eh ?